There is something uncanny in the ability of Iran’s top mullah, Ali Khamenei, to speak his mind clearly and openly without hesitation or evasion. It’s a quality that his top U.S. lobbyist, Trita Parsi of the National Iranian American Council, would be well-served in adopting, but unfortunately that would defeat the cause of giving the mullahs in Tehran a $160 billion payday and a new supply of weapons to go along with two million barrels of oil sold every day on the open market. All of these things are part of the agreement reached between the Iran regime and the P5+1 group of nations last week. While the deal was being hailed by supporters as a significant advancement for peace and regional stability, Khamenei, the sole leader of Iran’s foreign and military policies, once again vented his vitriolic hatred of the U.S. and his stubborn support for spreading religious terror and extremism. 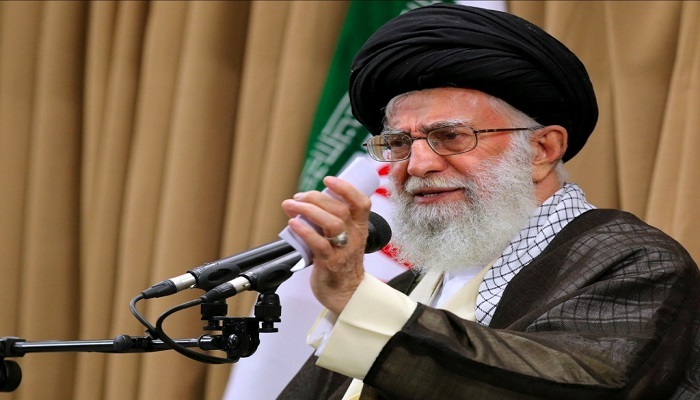 “Whether [the deal is] ratified or not, we will not give up on our friends in the region,” Khamenei added. Iran provides vital support for the Syrian regime, Hezbollah in Lebanon and Shiite militias in Iraq, among other groups engaged in proxy wars such as the Houthi rebels who overthrew the Yemen government earlier this year. He went on to hail the deal as a win for Iran in its decade-long struggle to preserve its nuclear achievements, including thousands of centrifuges that enrich uranium and the preservation of hardened sites protected against the possibility of air strikes. But Khamenei’s comments, coming on the heels of fervent comments by Parsi and other regime supporters that Iran had indeed changed its tune, provide ample proof from the regime’s top leader that Iran has absolutely no intention of changing any of its policies, which frankly should not come as a surprise to anyone since Khamenei has been nothing if not consistent in his attitudes towards the West. It should also give Democrats in Congress pause when they consider the only supporters and endorsers of this deal are Syrian regime head Bashar al-Assad, Russia which stands to become Iran’s biggest military hardware supplier and China which wants to lock up long-term sales of Iranian oil. Virtually all of other Arab nations including Saudi Arabia and Egypt opposing this deal. If undecided Congressmen really want to understand what is motivating the Iran regime and how this proposed agreement only emboldens and re-energizes a beleaguered regime, it’s worth reading Wall Street Journal’s deep dive into Khamenei’s speech and the deep-rooted hatred of the U.S. the regime’s leaders have and will always embrace. Supporters of the deal such as Parsi who claim normalized relations would bring about an attitude change in the mullahs’ worldview are just blowing smoke. Such predictions are premature at best and dead wrong at worst. “They overlook how central the hatred of the U.S. has been” to the mullah’s regime’s identity and ideology. WSJ article concludes that anti-Americanism allows mullahs to claim leadership among all extremists, even Sunnis, and it is the core of their policies in places like Afghanistan, Iraq and Syria. And that is the crux of the argument that Parsi and his colleagues are afraid of ever getting a public airing. The ruling elite in Iran, led by Khamenei and his fellow mullahs, are deeply committed to a shared religious worldview that places any nation, people or religion not in their specific extremist Shiite camp as being an apostate and suitable for elimination. It is the same religious dogma and approach that ISIS practices with great brutality and regularity and it shouldn’t come as any surprise since Iran under the mullahs, is truly the role model for ISIS. All of which means this deal in Congress will probably be a very hard sell.